Darlings! 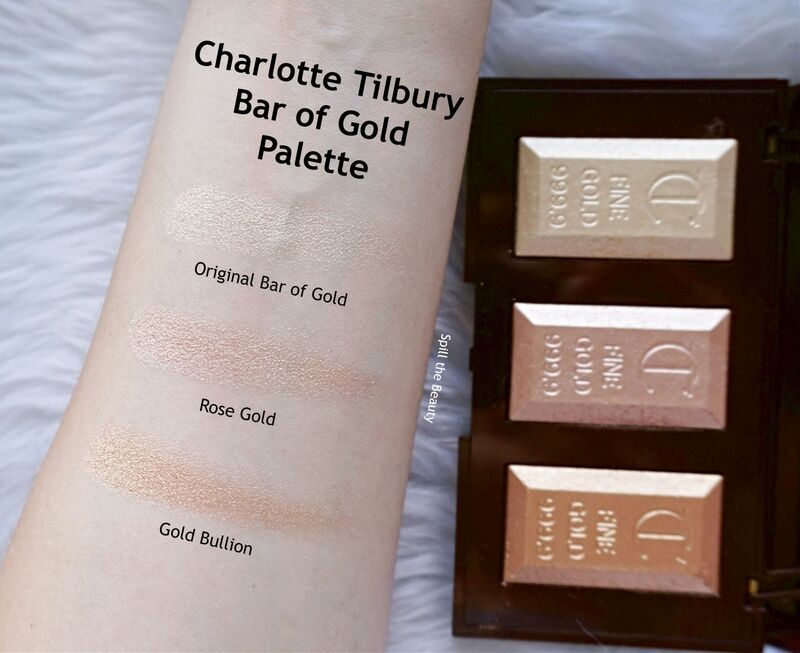 Charlotte has taken her sought-after Bar of Gold highlighter and turned it into a palette! Can you tell I’m excited? In order to make a palette, she added two new highlight shades to the family. The Charlotte Tilbury Bar of Gold Palette ($58 USD/$75 CAD) comes housed in a reflective bar-of-gold-like box, in a burgundy compact and a gold ray-of-light-style design, complete with a mirror. 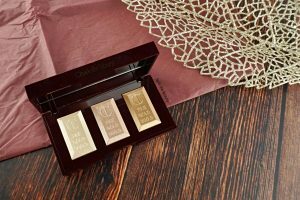 The palette contains three gilding highlights, each pan containing 2.5 g of product. 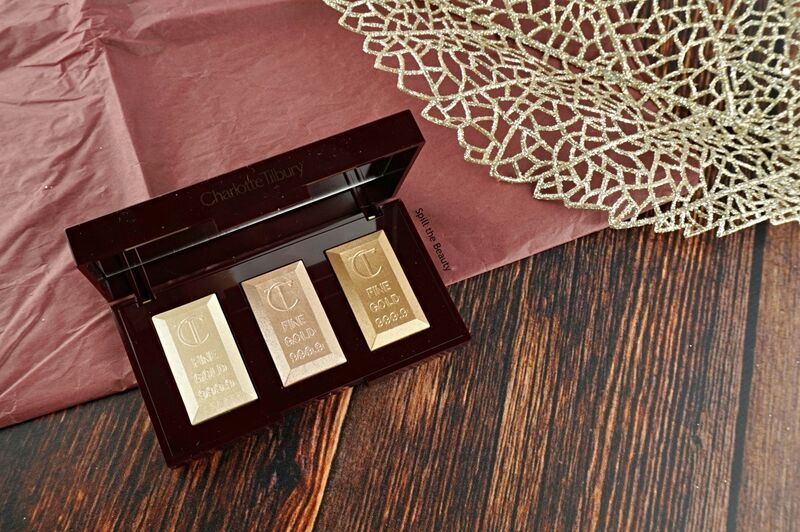 Original Bar of Gold is a pale, white gold sheen. This is the highlight that Charlotte Tilbury makes as a full-size single – the shade that started it all. Rose Gold is different from most rose gold highlights. 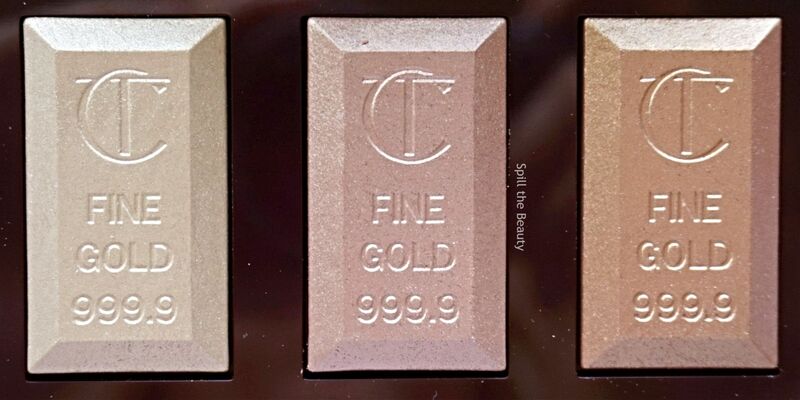 Usually, when you see a highlighter called Rose Gold, it’s usually some sort of warm copper shade. 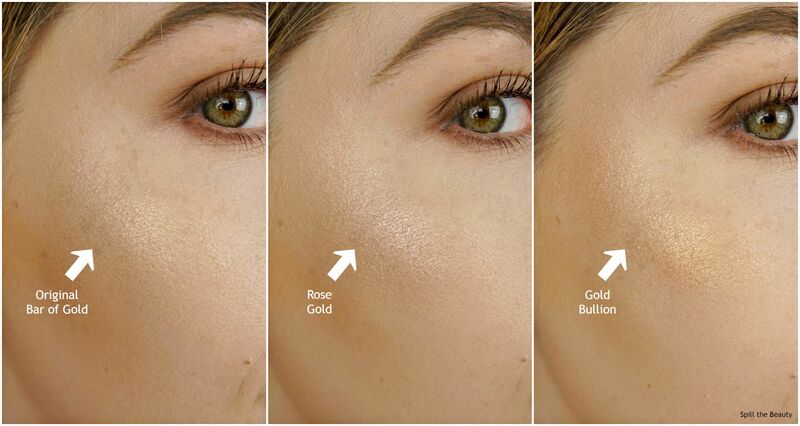 But just like the Burberry highlight in Rose Gold, this shade is actually that – a gold with a rosy hue. 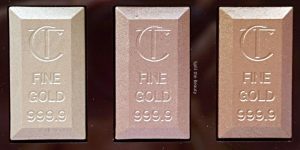 Gold Bullion is the most bronze of the three shades. Usually, the bronze shade in a highlighting trio tends to be too deep for me, but with a light hand, this shade worked on my fair complexion. It has some peachy-ness to it, with some gold reflects (the reflects seem to be a super fine glitter, but it’s not at all chunky). From far away (in the photo above), the shades look pretty similar – I attribute this to them having very similar undertones. That being said, when you get a bit closer (in the photo below), you can see how different the three shades are. As far as the formula, these highlights were a bit tricky. 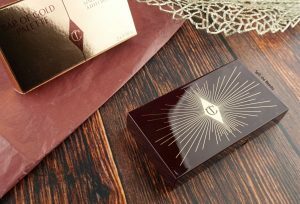 The gold bar embossing means that the powder is pretty tightly packed in, so it took some more aggressive brush swishing than I’m used to. The glow that you get out of these highlights isn’t that super-intense highlight that will make someone bust out their sunglasses. It’s more of an ethereal, glow – subtle, yet impactful. I can see these highlights really lending themselves well to those days when it’s too hot to sport a full face of glam. In fact, these highlights actually wear really nicely over bare skin (sans-primer). What are your tips for staying glowy in the summer heat?